Choose your campground, load up the family, and hitch up to hit the road. This unit will provide sleeping space for you, your spouse and the kids once the furniture is folded down for the night. Or you can enjoy all the open space from the dual slides to yourself, with the choice to invite overnight guests when you like. The kitchen island offers additional counter space as well as a sink to wash your dishes, and you have all the appliances needed to make a thanksgiving meal if you decide to camp during the holidays. Your family pet even has their own dish to eat from. The convenient dual entry bath allows access from the hallway and front master bedroom. Step inside, you will be glad you did. 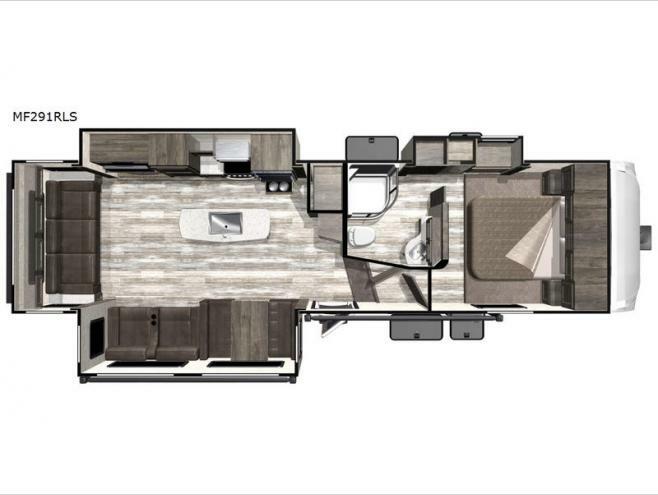 Each Mesa Ridge Limited travel trailer by Highland Ridge RV offers an arched vaulted ceiling, lino throughout which is much easier to clean than carpet, hardwood cabinet doors, plus solid surface countertops in the kitchen. The Thermal package includes a heated and enclosed underbelly plus more features allowing you to camp whenever you like. You will also find the Key-Alike system and PVC roofing membrane will provide you security and years of enjoyment. Come see all the convenient and stylish features that you will enjoy in your lightweight travel trailer.